Job interviews are the most important part of anybody’s career who has chosen to explore working for an organization. Attending an interview is always nerve-racking for an applicant, at the same time a ticket to the new world in their career. When seeing from employer’s perspective it is a time-consuming process as well as the most responsible task as every single employee hired contributes to the success of the organization. However, the main purpose of the interview is to find a perfect match for the organization. There are many types of interviews conducted all over the world. And one such prominent interview method is an unstructured interview. Let us now have a look at what is an unstructured interview. An unstructured interview can be defined as an interview which does not follow any particular format or style of questions. Even though, the interviewer has some predetermined unstructured interview questions to examine the whole pattern might be changed according to the conversation with the candidate or sometimes the interview might proceed according to the candidate’s response. This kind of interview is more like a non-directive interview and has a friendly approach to it. Unstructured interviews are like a free flow conversation which is very informal and open to discuss. Mostly these kinds of interviews are conducted randomly by higher officials of the organization who hold an authoritative position. Even though the unstructured interview is a very informal type, it has lots of purposes same like a structured interview. Good use of an unstructured interview depends on the interviewer. The interviewer would be able to assess the candidate very well because of the sudden free-flowing questions and mainly because questions are raised from the candidate’s reply. 1. Purpose of the interview. 2. Interview questions should not deviate from the candidate’s skill set. 3. Conversations should not move out of the topic and should be minimal. 4. The interviewer should be skillful and should have a good experience in conducting interviews as the person should not stumble in the middle of the interview. 5. Interviewers should also have a good exercise on how to proceed with an unstructured interview as it is very tricky and it adds more responsibility towards the interview process. In an unstructured interview, the interviewer gets to know the person better as he tries to know from his perspective. For example, in an interview, the interviewer asks the candidate about how to market a mobile phone and expects a different answer. The candidate explains it with various techniques involved which the interviewer might not really know. Hence, the next question is based on his/her answer which is a perfect example of an unstructured interview as the interviewer is able to guess the depth of the knowledge. Hence, an unstructured interview gives a better understanding of the candidate. A structured interview might move based on the pre-determined questions which the interviewer puts up in the interview. When it proceeds in the same way, the interview might move in a formal way and strictly stuck to the same area. In case of an unstructured interview, the candidate might be very comfortable as it proceeds like a conversation than one on one type. And moreover, an unstructured interview has a flexibility in explaining the concept in a very informal way which exhibits the pure knowledge rather than a bookish explanation. Hence, an unstructured interview is very flexible and comfortable to both the interviewer and the candidate. Most of the unstructured interviews happen to be very realistic and practical as it analyses and the interview happens in a very spontaneous way. The interview questions or answers happen to be very spontaneous and it shows the real intentions and knowledge of the candidate to the interviewer. Hence, unstructured interviews are a very practical method to analyze the candidates. Unstructured interviews are va ery valid comparison to structured interviews because of the thorough understanding of the concept as well as the interviewer will be able to clarify the doubts of concept told by the candidate. Hence, the unstructured interview is something which has a clarity and it is very interactive too. In most of the formal interviews like structured interviews, the question asked are very direct and it sticks to simple bookish replies. Hence there is no opportunity to communicate or discuss neither interview questions nor the answer. Whereas, in unstructured interviews, as the interview questions are very informal and spontaneous there is good communication between the interviewer and the candidate. Unstructured interviews help the candidate to know totally about the organization as it is a very informal kind of interview. In those cases, the candidate would be able to understand better about the work culture, how the whole organization works completely and also about the management etc. Hence, unstructured interviews help the candidate to develop a hope about the organization. There are many factors which excite the candidate to work in an organization. Few factors are like mostly the pay scale the foremost, job role, and the management team etc. But above all, one more important factor is the team or the employee’s attitude towards the organization. In such cases, when the interviewers develops a good rapport it will allow the candidate to develop an interest or the candidate will naturally get attracted towards the organization. In an unstructured interview, as the interview process does not have any proper direction it might be time-consuming. As sometimes the interview questions do not have a specific format and not pre-determined, the interviewer might not know where to stop and how to decide about the answer. And also sometimes it also will raise branch questions from the uncertainty of the answer. Hence, there is a lot of time consumed in an unstructured interview. Mostly all the interview questions in an unstructured interview have no judgment about the answer, the interviewer or the candidate tend to divert from the topic and deviate totally out of the purpose of the interview. Hence, the only proper experienced person in unstructured interviews has to have opted else the real purpose of the method of the interview might go waste. We cannot hope all candidates, to be decent enough take the right intention of the unstructured interview. There are chances that the candidate might totally take advantage of the informal way by getting into informal arguments, or irrelevant topics and losing the real intention of the interview process. Hence, sometimes unstructured interview process might not suit all candidates. The real intention of the unstructured interview is to make the candidate feel comfortable and interactive. But, there are lots of chances that the candidate might develop a misconception about the professionalism of the organization. They might also feel that the organization does not function in a very formal way. Hence, unstructured interviews have to be conducted in a correct way to avoid creating a negative opinion about the organization. In an unstructured interview, there are a lot of chances of talking about many official topics. Sometimes in a flow, it might also lead to the discussion about the confidential issues about the organization. Hence, unstructured interviews have to be planned in a way and have to be moved with a grip without interacting about the confidential matters or any kind of irrelevant official issues. Interviews are conducted with the real purpose of evaluating the candidate and bringing them inside the organization. Be it structured interview type or unstructured interview type, the real intention is to select the right candidates for the organization. Especially unstructured interviews are mostly conducted to bring a closeness towards the organization with the candidate as well as to make the candidate feel comfortable about the interview. Mostly many organizations have started adopting unstructured interviews as it really helps to know better than a formal structured interview. It is better if the right interviewer with the good amount of experience in unstructured interview conducts the interview. Hence, it is in the hands of the interviewer and the candidate to make most of the interview method and get into the organization. 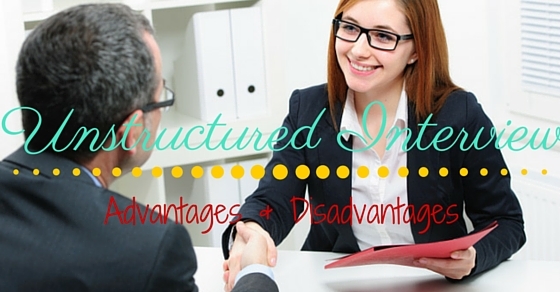 Hope this post helps to understand better about the unstructured interview, its advantages and disadvantages.